Necessary Arrangements, curated by Jennifer Samet, features recent still life paintings by Simon Carr, Xico Greenwald, Ying Li, Janice Nowinski, Betsy Podlach, and Thaddeus Radell. 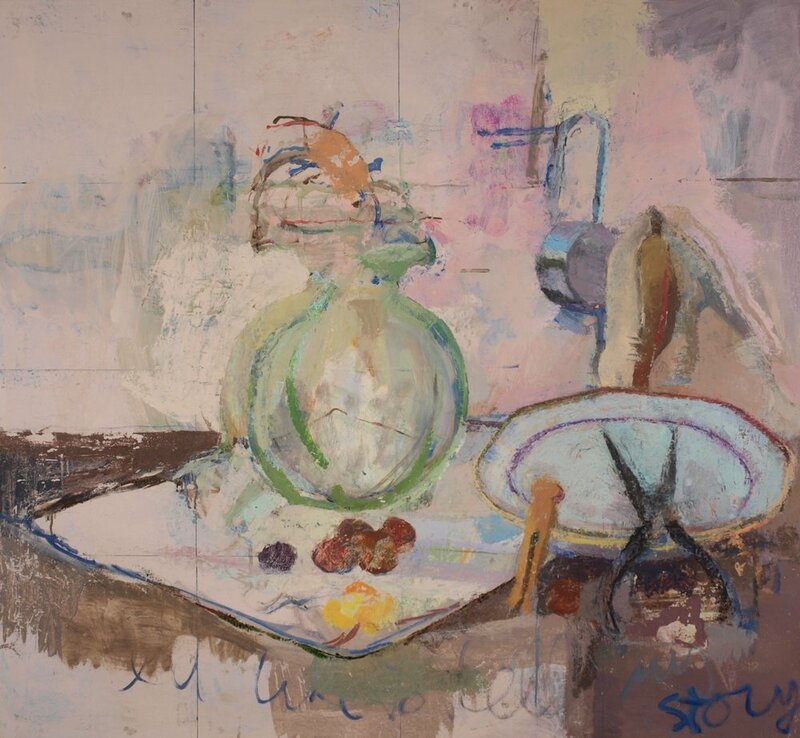 Necessary Arrangements focuses on the genre of still life, paintings that begin as tabletop arrangements and from there are translated into compelling compositions of forms and colors. The artists in this show share a commitment to representation and the narrative that comes with the depiction of recognizable objects, as well as a serious engagement with the abstract organization of their painting. United by an effort to further the living tradition of still life, each of the seven artists in this exhibit approaches the genre differently- both what they paint and how they paint; cluttered tabletops or spare still life setups, thick paint in bold strokes or thin paint applied with a knife, restricted, tonal palettes or full-spectrum color- through still life, the seven artists in Necessary Arrangements, are carrying on a contemporary conversation with one of art history’s richest traditions. To paint the still life is to both freeze time and call our attention to its infinity. The flower, cut and taken out of the landscape, is transformed; the moment of transformation can be captured forever in paint. Vessels, cups, knives, can become animated by geometry and rhythms of painting. These sorts of transformations and animations are visible in this group of six painters, which we could divide into two groups. In one are Carr, Podlach, and Greenwald, who handle the objects as discrete, and let a story build through their elemental nature. In the other are Radell, Nowinski, and Li, for whom the interactions of the objects into an overall surface become the story. The allure of still life is partly that challenge to metamorphose the object. Carr’s flowers often stretch across the canvas like hyper-extended arms, dramatic hand gestures. He says that gladioli are like “some kind of ocean life, something from a reef, reaching, breathing, searching for food and light.” Radell approaches the metamorphosis in reverse, returning a specific object to its geometric basis. 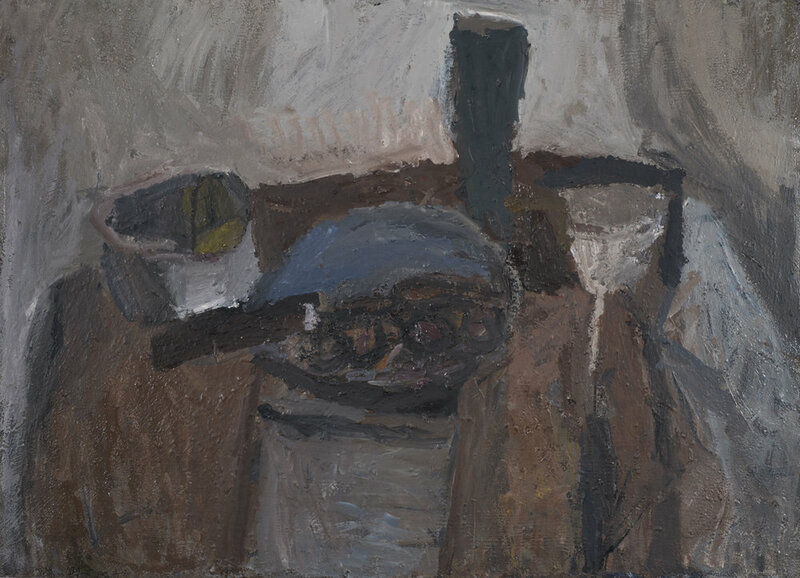 Italian coffee makers, “the first object, from time immemorial, that gives each morning its meaning,” cones, bowls, toy boats are pared down into building blocks of form, their color neutralized into Radell’s gray-brown canvases, the arrangements enlivened, made lush. The objects are no longer portraits; the temporal becomes the repeated structuring of space. For each of these painters in this exhibition, it is the slower revelations that count, that allow the object to transform. Over time, the personality of the flower is immortalized into portrait, the inanimate is animated.